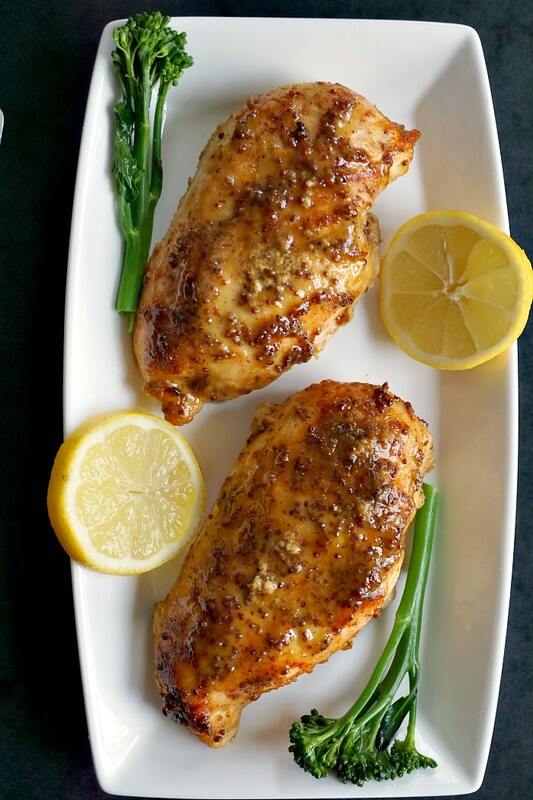 Baked Honey Mustard Chicken Breast with a touch of lemon, an absolutely delicious, low-carb and healthy meal for two. 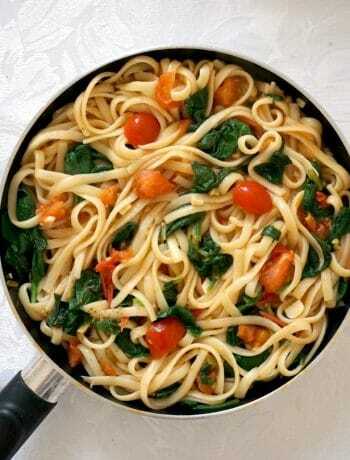 Serve it with broccoli spears or any other veggies of your choice. There is hardly any preparation needed, and you get some moist chicken breasts cooked in a super tasty honey mustard marinade. Planning a romantic dinner or perhaps you want to impress your other half with a lovely cooked dinner? Nothing simpler, no fancy ingredients required, and the taste is out of this world. January can be a tough month, pockets are kind of empty after all that Christmas shopping, still trying to get around that healthy eating resolution. And on top of everything, the weather’s miserable: short, dark days, and too cold. A night in sounds fantastic,doesn’t it? Especially if you want to make it to pay day.I know, long way to go. But this meal, apart from being insanely delicious, only costs about £6. You really can’t beat that! So, cuddle up on the sofa and enjoy, you are in for a treat! Looking for romantic meals for Valentine’s Day? 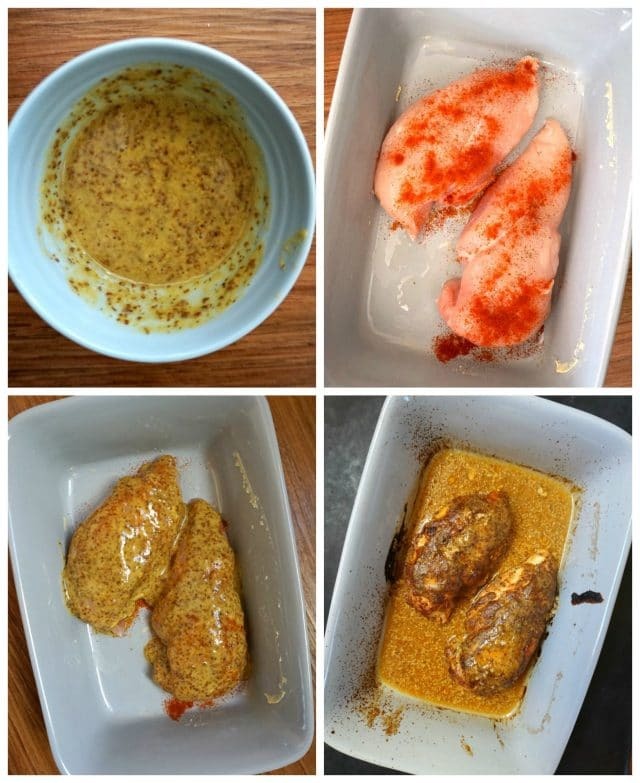 Why not save this baked honey mustard chicken for Valentine’s Day? It’s the perfect recipe for a romantic meal, it looks posh and healthy too. Plus, trust me, you will get you lots of praises. I don’t know anyone who doesn’t like chicken ( well, apart form people who choose a meat-free lifestyle). I love chicken myself, as you can probably tell from the amount of chicken recipes l post. And even my husband liked the meal, and he’s not really into eating meat of any kind. Other chicken breast recipes that would be fantastic for Valentine’s Day are my Baked Spinach-Stuffed Chicken Breast or the Chicken Kiev. How do you make honey mustard chicken? Right, as I promised, this recipe can’t be any simpler. First, make sure the oven is pre-heated. It helps cook the chicken a lot quicker. All you need to make the honey dijon mustard chicken marinade is to mix together the sauce ingredients, and that’s it. The sauce is runny, how to fix it? Note! I found that the best way to keep the marinade from staying on chicken is to sprinkle it with paprika before adding the marinade. Please see the right-hand size top photo above. It really does the trick, and the sauce is guaranteed to stay where it is supposed to stay rather than ending in the baking dish. How long do I cook the honey mustard chicken for? The chicken is ready in about 30-40 minutes. I usually cook it for longer, just to make sure it’s cooked ok, undercook chicken is super bad, so I’d rather be on the safe side. What temperature do I cook the chicken breast at? The chicken should be cooked at 200 degree Celsius, or about 400 degrees Fahrenheit. The chicken breast will be beautifully moist, melting in your mouth. And that’s it, a super delicious chicken dinner recipe that never fails to impress. 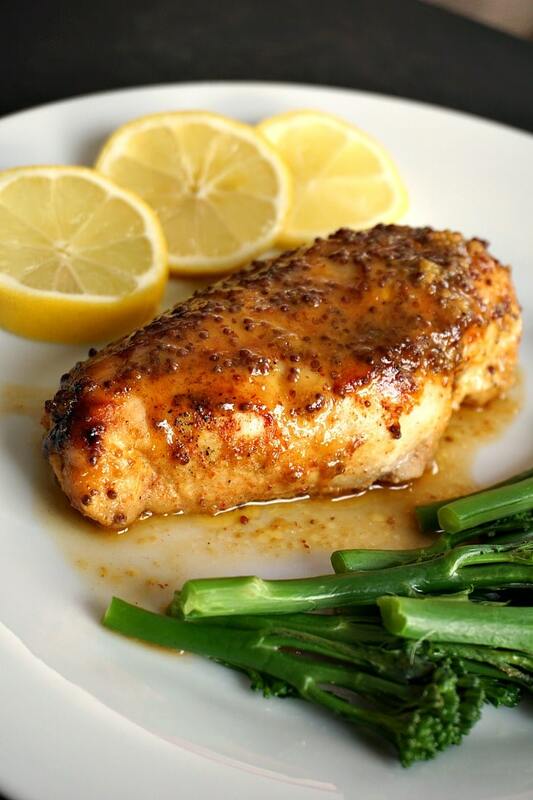 If you’ve tried this LEMON HONEY MUSTARD CHICKEN BREAST or any other recipe on the blog then don’t forget to rate the recipe and let me know how you got on in the comments below, I love hearing from you! You can also FOLLOW ME on FACEBOOK, and PINTEREST to see more delicious food and what I’m getting up to. 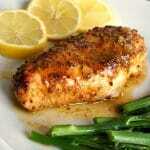 Baked Honey Mustard Chicken Breast with a touch of lemon, a delicious meal for two. Healthy, low-carb, perfect for Valentine's Day, if you are planning a romantic dinner. Season the chicken breast with salt, pepper and paprika before adding the honey mustard marinade. The paprika will help the marinade stick to the chicken. Add a few tablespoons of water to the baking dish half the way through cooking, this will ensure the chicken stays moist and the edges don't dry up. I think the oven temp. is incorrect. Needs to be higher. Hi Maggie! Thank you for your comment! I think it really depends on the type of oven and of course the size of the chicken. Too high the temperature might dry the chicken breast out, as there is no fat at all. With my oven l find that the 200 degrees Celsius works well with chicken breast and it keeps nice and moist. 45 minutes is really more than enough for the chicken to cook through at this temperature. I hope this helps. READ RECIPE CAREFULLY BEFORE YOU TRY AND CORRECT IT!!! Mi-a placut reteta.Cu siguranta ca o voi incerca! Multumesc! Sper sa va placa! 200 degrees Celsius is the equivalent of 400 degrees Fahrenheit. Thank you for your comment, Lisa! You are right, probably the confusion was caused because of the difference between F and C. In Europe everything is set in Celsius, going forward l might list the temperature in Fahrenheit too, just to make it easier. Many thanks! I think the confusion is because the oven temp is listed in Celsius and some of us are more used to Fahrenheit. 200 degrees Celsius is equal to 392 degrees Fahrenheit. There is an easily memorable formula for Celsius to Fahrenheit conversions: simply multiply the original figure by 9, divide by 5 and add 32. To convert the other way, just reverse the equation by subtracting 32, multiplying by 5 and dividing by 9. Thank you, Sandi! Very usuful to know how to convert to Fahrenheit, l shall use it from now on to list both of them. I haven’t eaten any chicken recently, but when I do eat it, I love honey mustard on it! This sounds delicious– and your presentation is so pretty! This does look perfect for Valentine’s Day! I love cooking with Dijon mustard. It’s so flavorful. I love a good simple recipe. Especially one that sounds as Decadent as this. And lemon at the end… what a smart idea! Saving this recipe!! I love the combination of mustard and chicken. I can’t wait to try this particular recipe. I just have a quick question. Your recipe lists whole grain and dijon mustard, along with one tablespoon of honey. Would it be okay to just use three tablespoons of prepared honey mustard instead? I’m a huge fan of honey mustard, but I really don’t like the taste of dijon. What are your thoughts? Thank you for your comment, Byron. You can use any other type of mustard instead of dijon, l didn’t quite like the taste either when l first tried it in England, as back home we mainly use a sweeter kind of mustard. The dijon adds a bit of sharpness to the chicken, but if you use a tad of lemon l think that should be ok anyway, so do use the prepared one, l hope you will like it. I love the ease of this dish yet full of flavor. I love how the mustard and honey combine so beautifully to deliver such an attractive look. 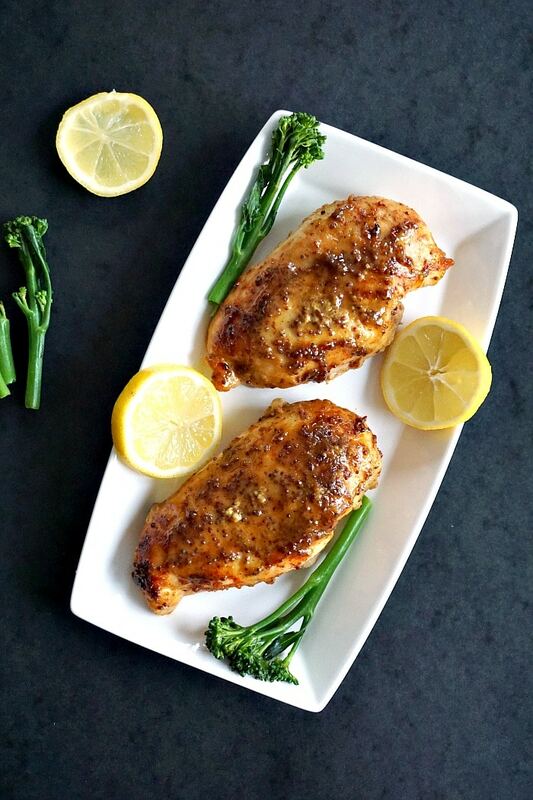 The lemon and broccoli are a nice contrast to the chicken. You are right, this would make a lovely Valentine’s Day dish for that special person. Nice job. I make a very similar recipe to this at least 3 times a month. Our family LOVES the flavor of the honey mustard sauce and chicken. I love to add thyme, rosemary or dill to it for extra flavor. Truly a favorite in our house, yum! I love recipes that don’t require a lot of ingredients but are packed with a ton of flavor. I can tell just by looking at this it definitely would be flavorful 🙂 And Dijon mustard is a favorite of mine to season with! Your photos are absolutely stunning!! I love pairing honey mustard with chicken, its one of my favorite salad combinations too. 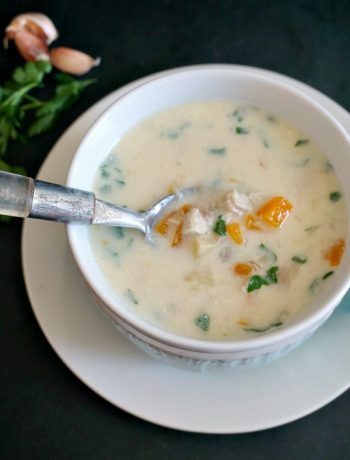 The lemon juice is such a great idea to go with this recipe. I’m going to have to make this for dinner this week! Thank you, Heather! I hope you’ll enjoy it! Love your plating style, some time it’s very tough to get a shot with brown color food. Dijon mustard are very good with protein based food. Thank you, very nice of you! We love honey mustard chicken and have it often for dinner! Your version looks delicious and the photos are beautiful! This chicken looks incredibly delicious and beautiful!! I never think of adding mustard to my chicken but definitely should. Love your recipe, touch of lemon.. oh yum!! I like the combination of two kinds of mustard, to get the two textures, I assume, as well as two slightly different flavors. And it certainly does combine well with honey! Honey mustard is one of my husband’s favorite flavors, so I’ll have to try this for him. 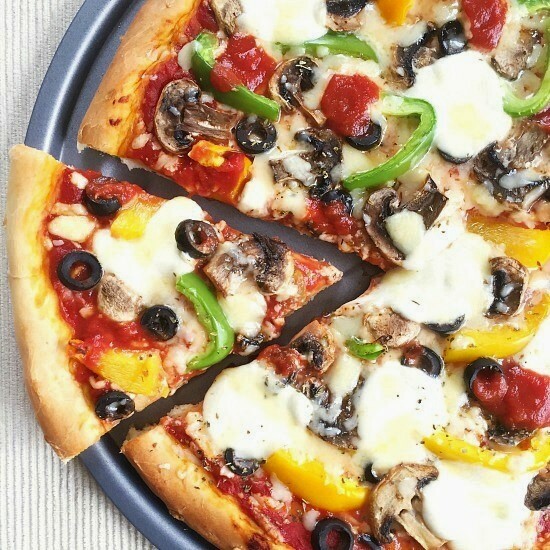 I love how easy the recipe is – nice and hands off for those busy weeknights! I love love love whole grain mustard, and honey mustard anything really… So this recipe is right up my alley! And you’re right – perfect portions for a delicious night in for two. Wonderful recipe! Your photos are just gorgeous! I love honey mustard but I think I have more experience with chicken nuggets being dipped in honey mustard sauce, lol. This sounds much healthier and honestly, way better! WHOA. I wasn’t even hungry when I open this page up – but now I want to lick the screen. The photos are GORGEOUS! which I guess makes sense, given your blog name… er. lol. Putting this on the list to make! They say you eat with your eyes first and my eyes totally feasted on this delicious chicken! Looks so yummy! Nice photos and a nice way to make chicken breast tasty! Great recipe. But when my timer went off after 35 minutes and my chicken was still raw I was really confused. Then my husband and I realized you have the temp listed in celcicus. I would put a heads up in your article for people who are more used to Fahrenheit! I am sorry about that, l will amend the recipe now. I hope you did enjoy the recipe after correcting the temperature. I used this on tilapia and it was amazing! Made this tonight – hubby and I loved it! So easy to make and delicious. Thank you for your comment! I am glad you liked tge chicken, it’s one of my favourite recipe. So disappointed!!!! This recipe smells good as it’s baking, but my chicken is super dry (even though it released juices in the pan), and none of the mustard sauce marinade stayed on the chicken. Ugh….here’s to plan b. Need to fix this somehow so we can eat dinner!!! I am sorry that you did not enjoy the recipe. This is by far my post popular recipe whic has been shared over 300k times across all social media channels, and an overwhelming number of people commented that the chicken turned out great. There could be a number of factors why the chicken turned out dry, like the size of the chicken breasts (the ones supermarkets sell in the UK are pretty large), the temperature of the oven, and how long you cooked it for, how much marinade went on the chicken. In my instructions l also mentioned adding water to the pan if needed to keep the edges moist. So perhaps if you could give me more details about all the above mentioned, l could get a better understanding what went wrong.I hope that helps. Thank you for your comment. I decided to use both honey mustard sauce and marinade as I believe it depends how much time you have to prepare the chicken.If in a rush and need to get the meal ready quickly, just use the sauce straight away, otherwise, coat the chicken breasts with honey and mustard and refrigerate until you need it in the oven. It should keep well overnight. I hope this helps. Yes – Thanks Daniela ! My husband is not a chicken person so I’m trying it with Ahi Tuna. Hopefully it turns out well! Can you use something other than paprika? You can omit it if you don’t have it, that should not be a problem. Thank you for your comment! Glad you liked the recipe! I am glad you enjoyed it. Both chicken recipes are a big hit with us. Yum!!! I’ve made this 3 or 4 times now in the past 2 months. The first time I didn’t have any Dijon mustard so I substituted plain old yellow mustard. It’s actually not bad! If you want a bit more ‘zing’ try the yellow mustard. But I make it with Dijon too. Just depends on my mood. Thank you for sharing!!!! Thank you, Christine! That’s a good idea, I shall try the yellow mustard too, it sounds delicious. I am glad you’ve enjoyed my recipe. We just tried this recipe and are making it again so soon. It is a new family favourite! Glad you liked it! It’s a favourite of ours too. Are these bone in breasts? No, boneless, but the bone in chicken breasts would work too. Do you cover it in the oven? There is no need to cover it, it cooks well without. I couldn’t find plain whole grain mustard in my grocery store, all they had was horseradish & garlic, so I substituted it with coarse ground mustard. It worked wonderfully and is still a very nice looking fish. Thank you for sharing your recipe!